This LibGuide was designed to provide you with assistance in citing your sources when writing a paper or dissertation. The Chicago Manual of Style (16th ed.) is the default/standard style manual, and specifically, the Notes/Bibliography format of the Chicago Manual of Style, NOT the Author/Date format. The Purdue Online Writing Lab (OWL) provides excellent guidance, including a general introduction, a broad overview of the format, a sample essay, as well as numerous formatting examples for books, periodicals, and web sources. "When that research paper comes due and you’ve forgotten your style manual, get the guidance you need quickly with the Chicago Manual of Style QuickStudy® guide. Based on the 16th edition of CMS, this handy three-panel guide contains the information you need for writing academic papers to CMS specifications, pared down to the essentials, including common, real-world sample references for both CMS citation formats so that you can be sure you are giving appropriate credit where credit is due." With approval from a professor, students may opt to use the APA (American Psychological Association) style guide, especially for essays and dissertations that deal heavily with the social sciences. The Purdue Online Writing Lab (OWL) provides excellent guidance, including a general introduction, a broad overview of the format, a sample essay, in-text citation basics, as well as numerous formatting examples for books, periodicals, and web sources. With approval from a professor, students may opt to use the MLA (Modern Language Association) style guide. Review Purdue Online Writing Lab's Citation Style Chart for side-by-side comparison of Chicago, MLA, and APA Styles. 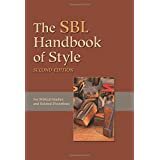 Students researching and writing in Biblical Studies are encouraged to use the SBL Handbook of Style (see the link below), especially for citations of Biblical and Classical sources. Citation and Research Management Tools abound (see the Citation Management Tab above). Just remember that these programs and services are only as good as the data (metadata) on which they rely. Students are responsible to check the accuracy of citations against the style guide. Citation Guides LibGuide by Esteban Aguilar and revised by Christopher Crawford is licensed under a Creative Commons Attribution-NonCommercial-NoDerivatives 4.0 International License.